This year not only did I sign up to be one of the room moms in Cody’s classroom (something I vowed I would not do again) but I also signed up to help out with the school’s largest fundraiser, XtraMath. I am not sure what I was thinking. The fundraiser involves having the students get pledges for money on the number of days or the amount of time they spend doing math problems above and beyond their normal school math work. There is a computer program the school uses to track the time and type of math problems the kids work on. We also provide worksheets for the younger kids or those who would rather put pencil to paper than use the computer. This year the fundraiser spans fifteen days. We have all sorts of incentives to encourage participation but the success of the program really comes down to the teachers. It is through the teachers that the necessary information gets sent home and it is through them that the excitement for doing the extra math is created. It was with this in mind that the XtraMath committee decided to do a little kickoff party to get the teachers fired up. We had coffee and goodies for them to eat. We had surveys for them to fill out on ways we can make the process easier for them and their students. We want their input and we want them to be happy and excited about XtraMath. So today I made mini math themed pumpkin muffins for the party. I have never done anything that even closely resembles frosting decorating but I think they turned out nicely. The pumpkin muffin recipe I found on New Nostalgia two years ago and it is a HUGE hit with everyone in the family. These muffins are seriously good and so simple to make. I make them a bit healthier by decreasing the amount of sugar to one cup and using one cup whole wheat flour and only two-thirds cup of white flour. Since I could not take all the muffins to school without risk of mutiny from the boys I set some aside. By the way they reacted when they saw them I think they appreciated it. This entry was posted in Food Glorious Food and tagged baking, Children, Cooking, Family, Food, Home, Kids, Life, Math, mini pumpkin muffins, Muffins, room mom, School. Bookmark the permalink. Thanks and they were easy to make too! Cute! Math seems to be the theme today! Yes, it does appear to be that way doesn’t it? These are GREAT! And thanks for the link to the muffin recipe. Decreasing sugar and upping whole wheat flour is a trick out of my book, too. Now is the time to tell you that when I was in 7th grade, I did, for extra credit in math, what I still refer to as “The Pi Project,” which involved finding pi several different ways. I cannot remember those ways. I do remember dropping toothpicks on some kind of grid….but no more. But perhaps that can be the theme for next year. I will wait anxiously for your pie recipe! How could this not make everyone smile?? Their faces are priceless – just like their mom! Ah, thank you Mimi! 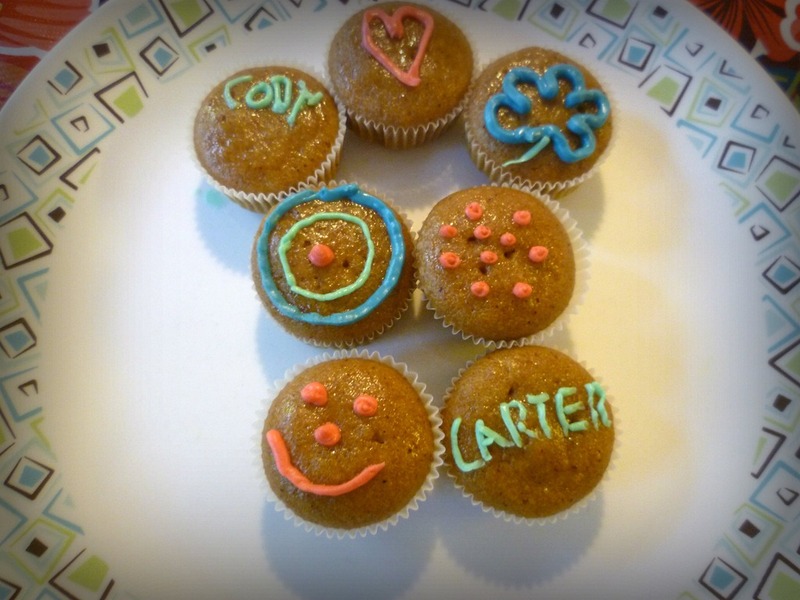 They were pretty excited to see the muffins with their names on them. Thanks! Simple and yummy is how I roll when it comes to cooking/baking. My biggest gripe about being room mom is the lack of help and support we get from the parents. I get that everyone is busy but seriously, it is not that hard to send a bag of candy corn for your kids Halloween party with them to school. I hate having to ask multiple times for assistance on school events and this year I am not going to get all worked up over it (or I will, because I know myself and just can’t help it). I too have a pumpkin muffin recipe that is also a big hit. Mine calls for one cup of chocolate chips. It seems such an odd combination, but OMG they are good! Oh no, I don’t think chocolate and pumpkin is an odd combination, it sounds good to me. Maybe I will add some mini chips to my mini muffins to add some extra yum! I think they boys could happily live off my mini pumpkin muffins if I let them. Would it be possible to use your photo of the mini muffins? I work at a school and we are currently offering a morning program called “Muffins and Math” for supplemental math help outside of the classroom and your picture is perfect! It would only be used in our weekly email sent directly to parents informing them of the program. Sure! Thank you for asking. I hope I didn’t get back to you too late. Your supplemental math program “Muffins and Math” sounds great! Enjoy.